For many of us a week or two of island-hopping and wine tasting was once the most desired and effectual solution when searching for a way to escape the trials of modern life. But these days with the tiresome realities of an always on, constantly connected work life, traditional escapes just aren’t good enough. That’s why more people are turning to an holistic, back-to-basics approach to their holidays. 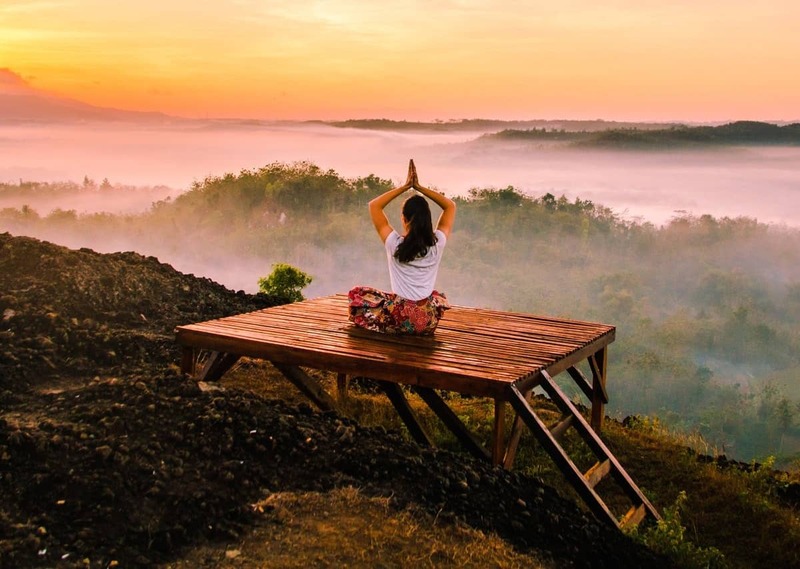 And yoga retreats such as The Yoga Evolution Retreat Centre in Portugal offer a way to reconnect with our inner-selves, to regain our energy and refocus our lives through mindfulness, meditation and yoga. A 3-hour drive away from Lisbon, hidden away in a valley in the lush Serra Da Estrela mountain ranges of central Portugal, Sue and Peter have created an authentic yoga retreat that puts health and serenity at the core of everything that they do. The retreat itself sits in 13 perfect acres just outside of Oleiros, but the real adventure begins as you make your journey from the capital. You’ll drive through miles of stunning unspoiled countryside, decompressing as the stresses of everyday life are replaced by pine forests and miles of uncompromising wilderness, eventually arriving to a beautifully realised safe space in an unspoiled corner of Europe. The retreat itself is spread across a traditional Portuguese estate, stone cottages, a wooden yoga shala and a series of charming eco-caravans that are interwoven by private gardens and a pool. Each are surrounded by that all important forest that adds to the feeling of a truly rustic, authentic yoga retreat. A true escape from modernity. Every room and caravan offers sweeping vistas of the undulating hills outside and there are lots of private spaces for unwinding, for meditation and for reading. The ambience at the retreat is communal and friendly. Silent contemplation and meditative breathing are encouraged in the mornings, while the evenings are spent either strolling in the wilderness under blankets of stars or sharing experiences in the laid-back communal spaces of the main house — and home of the hosts Sue and Peter. Experience is unnecessary as many of the retreats cater for all skill levels. But on the calendar you’ll find Ashtanga yoga retreats, Yin, dynamic yoga, shamanic yoga which unites the physical, spiritual and mental practices of shamanism and yoga, and women’s only weeks that create an inviting and friendly safe space just for women. But more importantly the atmosphere at all of these retreats is helpful and safe. Sue, Peter and their fellow yoga teachers and therapists are present and knowledgable and mindful of each attendee’s individuality. Each person here is an experts in the art of health. Take the food on offer, which is prepared with love and sincerity by resident nutritional therapist Selina, who cooks up a delicious, regenerative and all-natural menu each and every day. Every dish that Selina prepares is focused on your health and the yoga journey, designed to be calming to the mind and balancing to the body. Her attentions are focused on vegetarian and vegan fare that is nutritious and packed full of responsibly sourced whole foods, perfect fuel for a week spent balancing the body and mind. But in fact everything at the retreat has been thoroughly thought out to help you to relieve stress, to enhance your experiences with yoga and to teach and empower each person as an individual who is on a journey through life. The Yoga Evolution retreat is purposefully remote, exquisitely quiet, intentionally laid-back and perpetually idyllic. It is perfect for a yoga holiday in the rustic heart of Portugal — an oasis of calm in which to lose your troubles and find yourself. Sarah is a writer and guest blogger. Her work is regularly published in the national press and on many popular websites and blogs, including Huff Post and TheLondonEconomic.